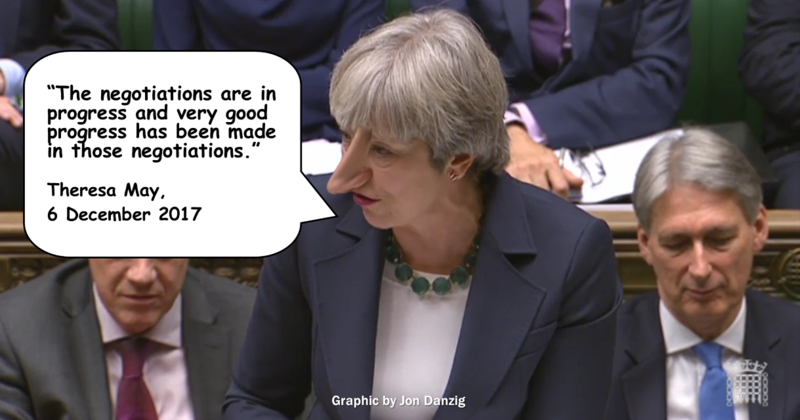 Did you notice her nose grow an inch? We can’t believe anything this government tells us. The Brexit negotiations are going disastrously wrong. Did Mrs May fly to Brussels on Monday just for a free lunch? No. It was one of the most expensive lunches in British history. She went there expecting to announce a deal had been struck with the EU to enable Britain to proceed to discussing a new trade agreement post-Brexit. Apparently, everything had been resolved: the issue of EU citizens living here, British citizens living there, the amount owing to the EU, and that thorny issue of the border between Northern Ireland and the Republic Ireland. So, had Mrs May achieved the impossible on the border issue? 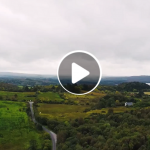 Just two days before last year’s referendum, she warned that if Britain voted for Brexit, it was “inconceivable” that there would not be a new hard border with Ireland. “If we are out of the European Union with tariffs on exporting goods into the EU, there would have to be something to recognise that between Northern Ireland and the Republic of Ireland. How on earth was she going to fix something that only last year Mrs May said was unfixable? Easy peasy! 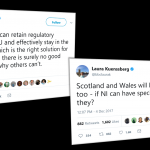 Just enable ‘regulatory alignment’ between Northern Ireland and the EU. What does ‘regulatory alignment’ mean? Who knows? Who cares? Clink of glasses. Tuck into the main course. Oh hold on, the DUP – the small Northern Ireland party that graced Mrs May with the favour of staying in power after last June’s disastrous general election (well for a small consideration of just £1 billion pounds, so easily plucked from Theresa’s famous ‘money tree’) – were having none of it. With a thunder face, Arlene Foster, the DUP leader, stormed onto our TV screens, with her tiny entourage of MPs, to rule out any move “which separates Northern Ireland economically or politically from the rest of the United Kingdom”. ‘Will you be staying for dessert, Theresa?’ ‘No, Jean-Claude, I had better get home’. ‘But we’ll have to make an announcement to the media’. ‘Ok, but let’s keep it short.’ ‘Will 45 seconds be ok?’ ‘Yes, of course’. No leading questions from the UK media. Nothing new there. The DUP now has the real power over the UK’s future relationship with the EU. Mrs May… she just has empty words, and a nose that grows longer by the day. Did you watch the five o’clock nose (sorry, news)? David Davis the Brexit Secretary, told Parliament that the 58 Brexit impact reports that he’s been boasting about for over a year don’t actually exist. 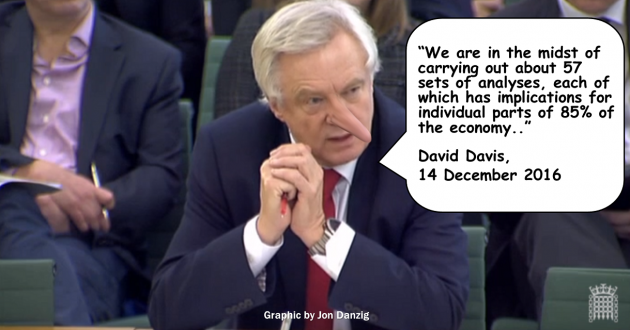 Like a naughty boy, Mr Davis had been summoned to the Commons Committee for Exiting the European Union to explain why he hadn’t produced full details of the sector-by-sector Brexit impact reports that Parliament had voted he must disclose. “There is no systematic impact assessment,” Mr Davis replied. 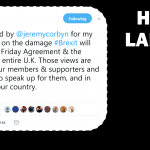 An incredulous Hilary Benn, the Labour MP who chairs the committee, asked Mr Davis if the government had carried out any forecasts on the possible impact of Brexit on the automotive, aerospace or financial services sectors. “The answer’s going to be no to all of them,” Mr Davis replied. “We’ve got a lot to do, but that’s one of the reasons we are taking our time to get prepared on all fronts. That’s why our 57 studies cover 85% of the economy. Everything that’s not affected by international trade. Oh, his nose looked long then. It’s looking longer today. Mr Davis is not in any position to negotiate anything. The bottom line is that he and his department have not done any substantial analyses on the impact of Brexit. He and his Brexit boss and fellow ministers are so intent on getting us out of the EU, that the details matter not one jot to him, or them. That’s why the government has no vision, no plan, no blueprint, no manifesto for Britain after Brexit. They have not got a clue what Brexit will mean for Britain, and have not bothered to do any meaningful research to find out. They are running the country blind, because they have blind faith that Brexit is going to be oh, so wonderful. There are calls now to hold Mr Davis in contempt of Parliament. Surely that’s a mistake? The entire government should be held in contempt of Parliament. They are running the state whilst being enemies of the state. The current government is not acting in the best interests of the country. Brexit was sold to the nation using a pack of lies. And now Brexit is being imposed on the nation using a pack of lies. I nose that. You nose that. And they nose that. This government must go. Nothing could be worse than the incompetent, imbecilic, inept gang of charlatans now running Britain to the ground. 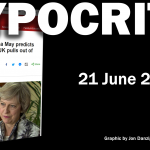 This entry was posted in Current Affairs, Democracy & Citizenship, Economics & Trade, Media & Communications, Politics & Public Policy, The EU and tagged Article 50, brexit, David Davis, EU negotiations, EU referendum, European Union, Theresa May. Bookmark the permalink.